Ann and I continue north to explore the Scottish Coast from the Mull of Kintyre towards Oban. 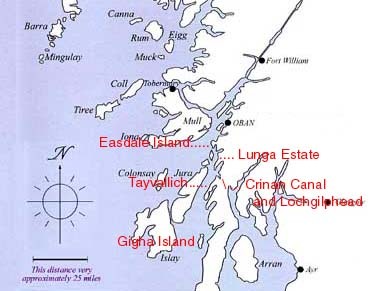 Following a successful two days on Gigha and two more in the Crinan area we moved north. 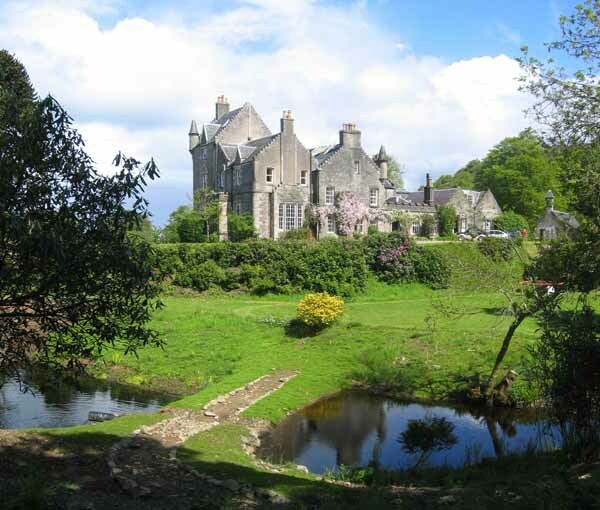 Lunga Castle and the grounds of Lunga Estate. As the main house was built on higher ground next to the stream, the main gardens offer an oasis of calm hidden from the prevailing weather. 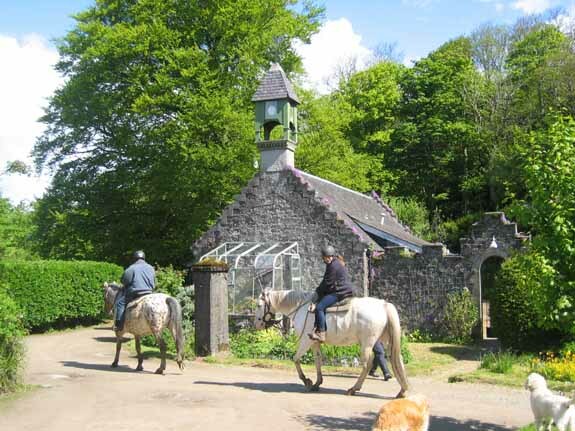 The current owner, Colin McDougal, is slowly reclaiming the gardens and rebuilding some of the features of the estate. 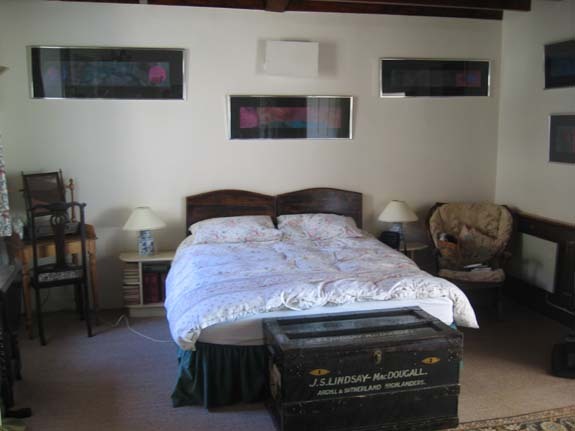 We had booked bed and breakfast which would normally be accommodated in the main house. 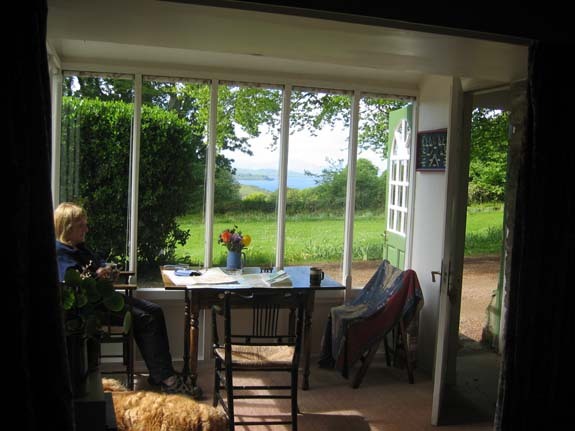 Unfortunately a small but significant fire over Christmas had put the house out of bounds so we were offered this delightful coachman's house and self catering b&b which was an excellent alternative. The view from our room extended over the gardens and the Shuna Sound to the high ground of Mull in the distance. Not a bad place to have breakfast ! The cottage and what we saw of the house was full of family memorabilia and each item no doubt had a story to tell. The trunk belonging to a distant relative and had travel labels for military visits to India in the last century. A regimental picture, showing the owner in full uniform at his passing out parade, just served to ask more questions than it answered. The potential for future investigation was enormous but our stay was limited and the scenery was calling. 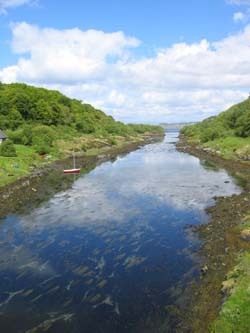 Craobh harbour, seemingly part of the estate, was another beautifully sheltered mooring which had been developed into a mecca for boats. 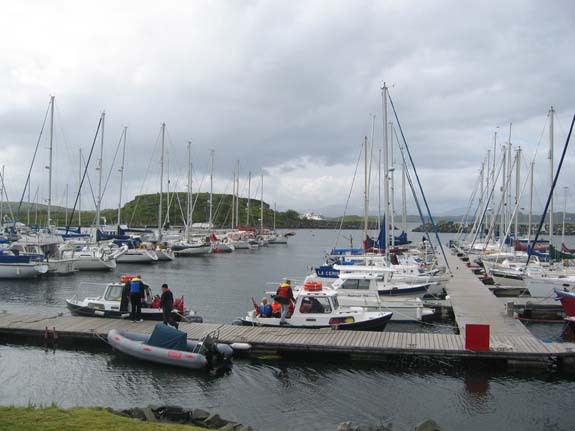 The pontoons held sailing craft of all sizes and the two motor boats in the foreground were busy ferrying passengers back to the "Hebridean Princess", an ex-Macbraynes boat now used for Western Isle cruises. The village included a boatyard/chandlery, a large pub and getting on for a fifty to eighty relatively modern houses, but many were self catering or holiday homes and the village seemed almost hibernating, waiting for the weekend or the summer holidays to bring it to life. 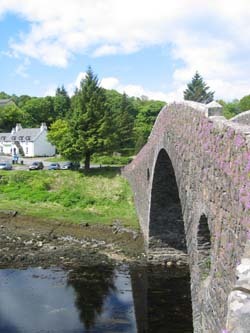 Clachan Bridge - The Bridge over the Atlantic - Seil Island. North of Loch Melford the Sound of Jura narrows progressively, spilling its tidal flow through the famous Gulf of Corryveckan and the Sound of Luing, until it is no more than a stone's throw wide. 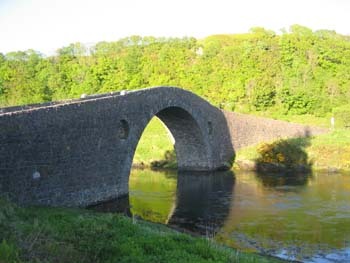 Here a fine single span bridge was built, its height allowing early sailing ships to pass beneath and allowing the road to access the island. The bridge, its beautiful (miniature geranium ?) flowers, and the clear waters of the tidal channel below. Over the island and suddenly a view of the deep blue open sea ahead. 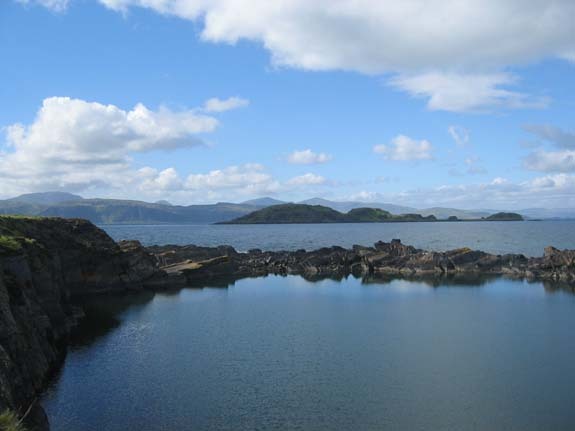 Left to right the islands are Belnahua, the Garvellachs, Easdale island (close in) and Mull in the distance. 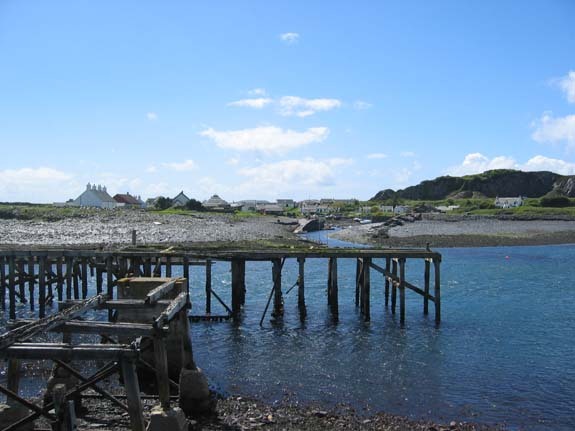 The pier at Ellanbeich, Easdale. 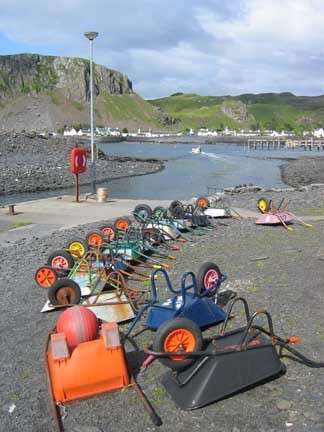 Easdale is an old slate mining community and its industrial past is in evidence all around. 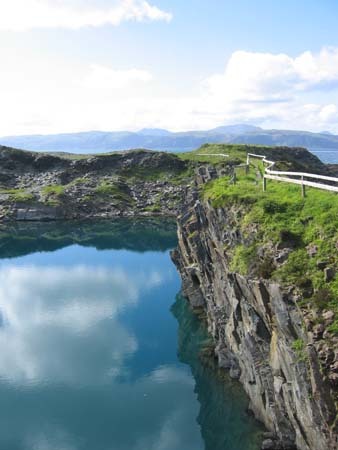 The inlet here is in fact a flooded quarry some 90 meters deep, which had started its life as a 30 meter hill. 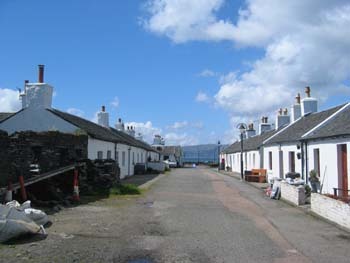 Millions of industrial and roofing slates were mined here and in the quarries on the island itself and the houses and the village grew around them. 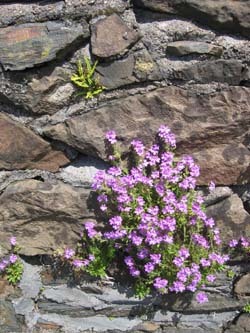 The single story houses were built from slate waste, in fact the village itself was built on reclaimed land as the quarry dug further into the landscape. 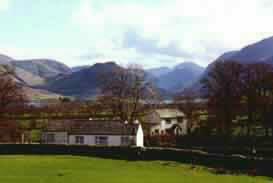 If you visit, make sure you leave time for the little heritage museum and the excellent restaurant by the pier. 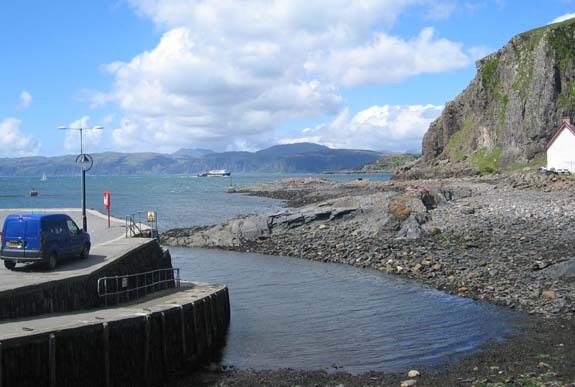 Looking across to Easdale Island, this jetty allowed quite large boats to come alongside. 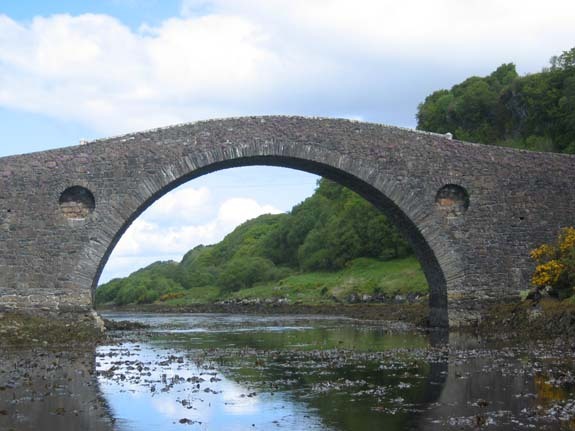 Surprisingly it was never used for loading slate but was built in later years to attract passenger boats travelling the west coast. The harbour side crane had been rescued and now stands fully restored in the village as a memorial to the olden days. Harry's first small boat ! Not very sure what to make of the new experience. 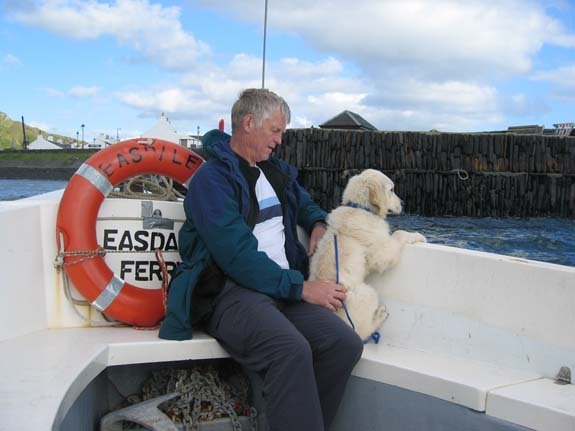 The small foot ferry takes just a few minutes to cross to the island community. With no roads and no cars the 50 villagers all seem to have their own wheelbarrows at the jetty . . . . to help carry home the shopping ! Each is painted a different colour and had house numbers to identify them, but pink wheelbarrows . . .honestly !! The quarries all extended below sea level and were kept dry by continual pumping. A major storm and tidal wave in 1881 caused considerable damage and heralded the decline and eventual closure. The last large scale commercial shipments left the quarry in 1911. Ben More and the hills of Mull viewed over Inish Island. In the foreground one of the larger of the many slate quarries, now flooded and tidal. 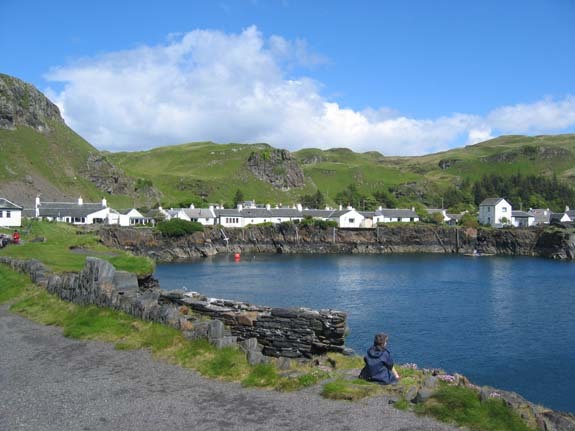 The community of Easdale island - about 50 strong - seem to enjoy a real island lifestyle. The island is full of history, whether it be in the landscape, the old buildings, or preserved in one of the two fine museums locally. 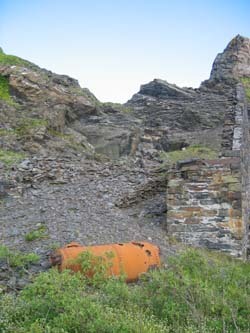 To the left an old steam boiler lies rusting in the ruins of its engine house. 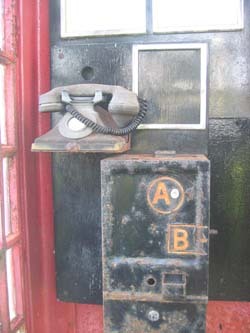 To the right, an original A and B type telephone in an old phone box at the island museum. 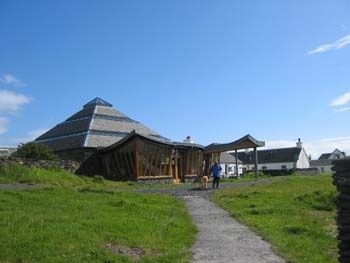 Things are moving on and the local village hall has been rebuilt and re-opened in 2003. It is of very modern design and from the look of the posters the locals attract some very interesting artists and have a busy social life. Back to the B&B, but not before an excellent meal at the award winning restaurant in Ellanbeich. On the way back of course we re-crossed Atlantic Bridge, this time with the tide in. The water was deeper now and flowing quite fast in a southerly direction. 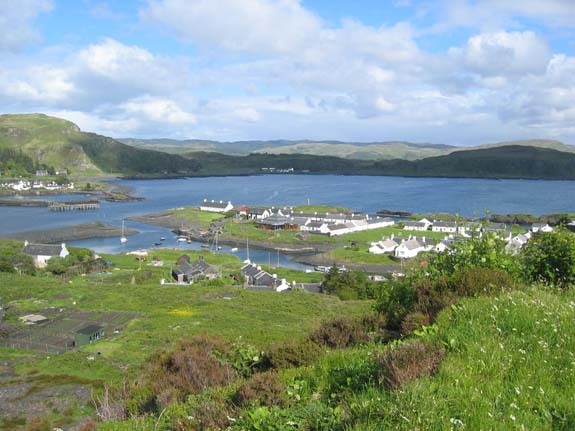 For more details of Easdale and the Slate Islands click here. This site best viewed . . . with the eyes.